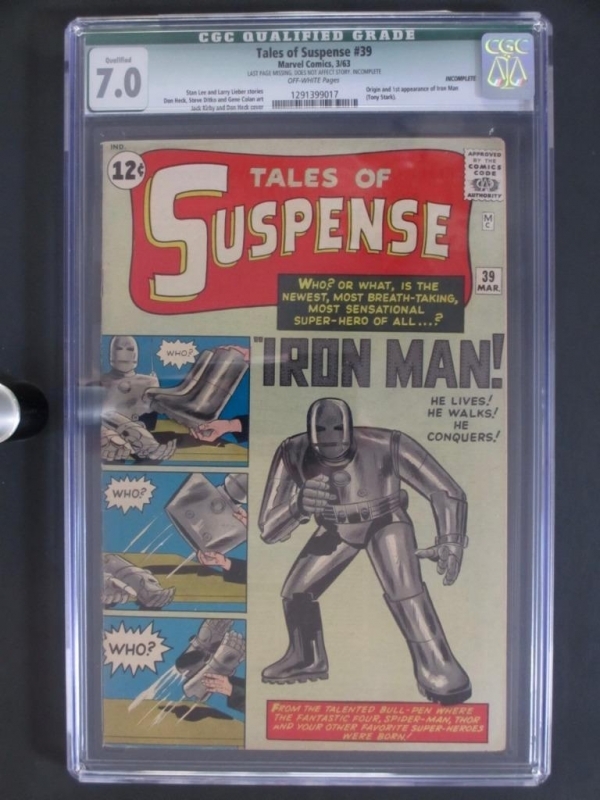 Tales of Suspense #39 - CGC 7.0 Q - Marvel 1963 - 1st App/ORIGIN of Iron Man!!! All items listed are checked to the best of our abilities and found to be UNRESTORED! Please click on the pictures to enlarge them. We offer LARGE pictures that once clicked, you can easily drag to your desktop for a closer look! 1st Appearance and ORIGIN of Iron Man (Tony Stark)! 1st Appearance and death of Professor Vinsen! 1st Wong Chu! Beautiful CGC 7.0 (FN/VF) Incomplete example - Off/White Pages with Excellent Gloss quality! Payment must be received within 3 days from the auction end date. We ship USPS PRIORITY MEDIUM FLAT RATE (2-3 Days) with tracking included! Boxed and well cushioned with bubble wrap/newspaper/packing peanuts. We offer combined shipping that will be calculated based on how much you purchase! Rates: 1st item = $29.99 and beyond that we offer combined shipping "at cost" for a much LARGER discount! All items are SAFELY and SECURELY shipped! We ship USPS PRIORITY MEDIUM FLAT RATE as well as USPS EXPRESS FLAT RATE, both with tracking included! Boxed and well cushioned with bubble wrap/newspaper/packing peanuts. We offer combined shipping that will be calculated based on how much you purchase! Rates for 1st item: Canada = $53.99 and Overseas = $63.99. Beyond that we offer combined shipping "at cost" for a much LARGER discount! All items are SAFELY and SECURELY shipped! Please contact us for other shipping options and rates! Buyer may return the item within 14 days. Item MUST be returned in the same condition and must be packaged as it was received. You will receive a refund for the full amount excluding shipping & handling fees. Returns not accepted on third party (CGC, CBCS, PGX) graded items. Each buyer will receive positive feedback at the end of every successful payment and we would appreciate feedback in return!